For more info, visit our web site (see link below) or find us on yelp and facebook ... search for SF Vacation Hut & give us a 'like'! Driveway Parking, SF MUNI Transit Passes, and use of one bicycle with lights, basket, U-lock, and helmet, may be negotiated with your reservation, for an additional price or deposit. Ask for details. 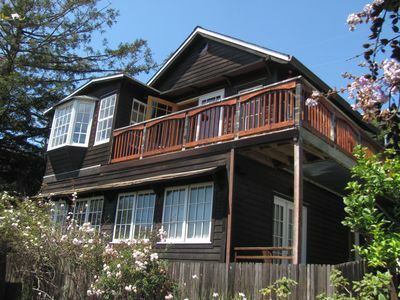 Vegan, Locavore, Omnivore: come one, come all, to SF Vacation Hut. You'll fall in love with this Organic, Eco-Friendly Studio Apartment, perfectly situated next to the internationally acclaimed eateries of the Mission, the Valencia Corridor, and Noe Valley. Whether you're in town for business, sightseeing, visiting relatives, or maybe even all three ... our goal is for you to feel at home from the moment you arrive. Your welcome package may feature chardonnay from a solar-powered winery in Napa, organic fruit and juice, breakfast, fresh flowers and gourmet chocolate. Plus we provide plenty of guide books, maps and more. 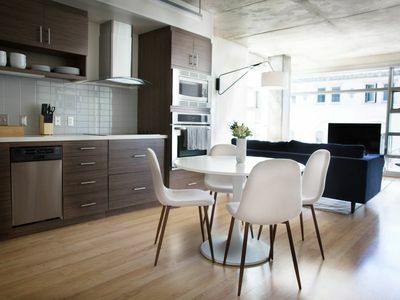 Don't miss the chance to live like a local in a beautifully furnished San Francisco apartment. SLEEPING ACCOMMODATIONS: Enjoy a luxurious night of sleep in the Queen-Sized Bed with hypoallergenic, eco-friendly mattress and organic cotton sheets. You'll find the European-style sofa perfect for reading, watching TV, or planning the next day of sightseeing. The sofa folds out to sleep an additional guest. OUTDOOR SPACE: Bring your yoga mat and suntan lotion! In the summer, the backyard is a SUN WORSHIPPER'S PARADISE. Lie outside and get an extra dose of Vitamin D. The Backyard Patio and Rose Garden (total size, 25 feet x 50 feet) has views of Redwoods and Palm Trees. LAUNDRY FACILITIES: The apartment has an In-Unit Laundry Room with Washer and Dryer (not shared; it's just for you!). Iron and ironing board, eco-friendly detergents and dryer sheets are provided. There's even a sewing kit and a tool kit. FULLY EQUIPPED KITCHEN: Prepare your own meals in the kitchen and serve meals at the dining bar built for two. Having friends over? Feel free to entertain them outdoors, as we have plenty of tables and seating at the garden patio with BBQ. The kitchen features a full-size Electric Stove & Oven, Programmable Coffee Maker, Dishwasher (!!! ), Microwave, Toaster / Toaster Oven, Blender, Coffee Bean Grinder, French Press, and more. Kitchen utensils, dishes, a full range of spices, and natural dish soap are all provided. PRIVATE BATH: The private bath has a tub with shower, and 100% organic cotton towels. Enjoy lavender-scented or unscented shampoo, conditioner, and soaps. We re-stock the dispensers with eco-friendly, all natural products. BUSINESS CENTER, EN SUITE. To keep you organized and in touch, the apartment offers a Laptop Computer ... all hooked up and ready to go, with fast, secure wireless internet and En Suite Printer/Copier/Scanner. Imagine how convenient it will be to print airline boarding passes, movie tickets & maps from the comfort of your own apartment. Of course you can also use the free wireless internet for your own laptop, iPad, or smart phone. The apartment includes an electronic safe large enough to store laptops and other valuables. TV and OTHER AMENITIES. Fast Wi-Fi, Land Line Phone ... Flat Screen HDTV with DVD/CD Player and Basic Cable TV Channels, and a Video/Music Library. The DVD selection includes a variety of domestic blockbusters, indie films, and international titles, from the 1930s to the 2010s, children's movies and SF classics like Harold & Maude, Star Trek IV (the one with the whales! ), The Birdman of Alcatraz, Mrs. Doubtfire, 'San Francisco' (with Clark Gable), The Flower Drum Song, and The Joy Luck Club. FOR CHILDREN: We have a 3-level portable crib with organic cotton mattress, organic cotton sheets, baby blankets, and bibs, high chair, hooded terry cloth towels, Graco pack and play with mobile, Euro Spa baby bath tub, bath toys, California Baby no tears/fragrance free body wash/shampoo, toddler toilet seat and step stool, children's books and DVDs, and more. Parents traveling with babies and toddlers are definitely welcome. 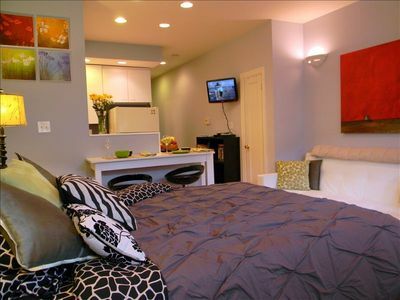 SIZE & LAYOUT: The Queen-Sized Bed and Fold-Out Futon are both in the Main Room. 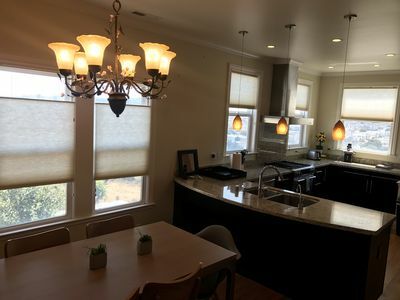 The kitchen and dining bar are open to the main room; beyond that you continue down the hallway to the bathroom, laundry room, and then out the back door to the shared patio and garden. The entire apartment is 490 square feet. 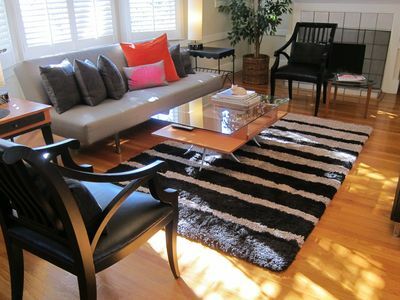 Due to size considerations, this apartment is best suited for a couple, or for parents with 1 or 2 small children. WALKING DISTANCE from Corporate Shuttle Stops: Google, Yahoo, Genentech, Apple, Facebook, eBay, LinkedIn .... check with your company to see if they still have shuttle stops nearby. 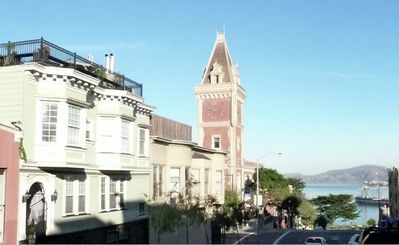 We're near 27th & Dolores. 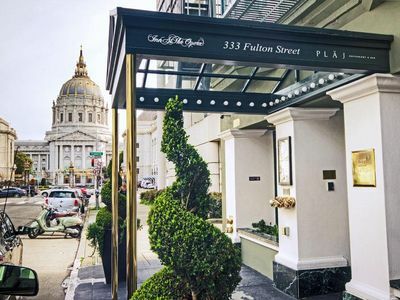 SF Vacation Hut offers close proximity to downtown and the excitement of city life, in a quiet residential location, walking distance to trendy gourmet / locavore restaurants as well as old-fashioned pizzerias, taquerias, and neighborhood stores. You'll feel like a native when you come 'home' to this peaceful guest apartment.